Posted March 8, 2017 by Josette Farrell in News. Turloughmore Comunity Alert will hold its AGM this evening Wednesday, March 8th in the Copper Beech Bar at 8pm. Members and non-members are welcome to attend. Anyone who wishes to put their name forward for a role on the committee is welcome to do so. the committee is looking for support in general from the community to help run the service. 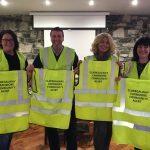 Turloughmore Community Alert was the first to use a 24-hour instant text alert service through Nightguard Security and also became the first community alert organisation to play a leading role in performing a citizen’s arrest in 2013. Since then, there have been no major incidents locally, but people must not become complacent. The community appear to be very happy with the service, but a little more help is needed at committee level. It’s your community and its efficiency ensures the safety of everybody. So please get involved. Any queries contact: 086 383 7954.